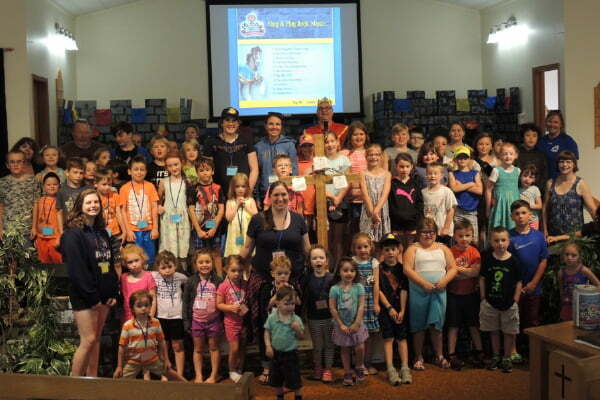 From July 16-20th, Uniacke Baptist Church (UBC) offered this popular Group VBS program, with the sub-theme “Where kids learn to STAND STRONG for God”! A dedicated team of just over 20 adults and Youth leaders, welcomed 66 children from a wide segment of the community and area. The daily themed crafts, “Sir Wally (a wannabe knight) skits and related Bible points, dramas & life principle demos were all popular with the young princes & princesses. The Lords and Ladies in training also persevered in reaching and surpassing Prince (Pastor) David’s Cream Pie and Ice Bucket Mission challenges, which raised $625 to be split between local charities Uniacke Wishgivers and Beacon House Food bank. Financial & in-kind Support for the program was received from outside the congregation including a first-time municipal grant towards the recreational element in the program.